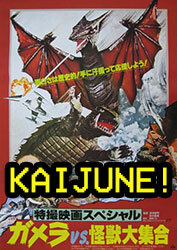 A series of volcanic eruptions peak Gamera’s interest, and awaken a long dormant flying monster called Gyaos. This all dovetails with a conflict between some local villagers and a construction crew building an expressway. A young boy, Eiichi (Naoyuki Abe) is rescued by Gamera and they become friends as both work together to ride the world of the ravenous Gyaos. 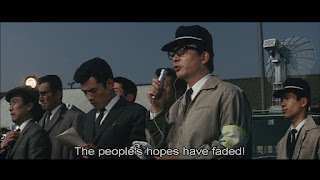 Gamera vs. Gyaos is the film which bridges the more adult approach of Gamera (1965), and Gamera vs. Barugon (1966) with the children’s films that will come later. As a result of being in a mid-transformative state, this is a film that gleefully combines local politics, an adventurous kid with all the answers, and blood drenched giant monster fights. Tonally, it’s all over the place, one moment it tries to evoke some simple comedy, the next moment deliver the horror of a giant monster attack. The shifts are jarring but somehow manages to settle into their own weird aesthetic by the end. The only monster that breathes no-passing zones. Gamera vs. Gyaos puts all its monster action up-front and center. The fights and attacks are plentiful and surprisingly well choreographed. Once again the actual monster suits are not exactly top notch, but they manage to exude their own unusual charm. Gamera emerges from this film with his own gruff but playful personality fully formed. He feels much less like an animal, he reacts to pain, formulates plans, and befriend annoying kids who won’t leave him alone. As it should be, the real attraction here is the villain monster, Gyaos. He’s a large triangle headed bat-thing that borrows from Rodan (1956) more than just a little. As is now tradition, he possess some strange powers and weaknesses, including a sonic beam, gaseous armpits, and an aversion to sunlight. He’s also a big fan of blood, so we get to indulge in the kaiju film rarity of a monster actually eating people. Also adhering to tradition, is the human element throwing together a silly plan to defeat Gyaos. This one tops them all so far as the military constructs a spinning platform filled with artificial blood that will make Gyaos dizzy and unable to retreat when the sun comes up. To be fair, this plan is inspired by a child. That child, Eiichi, begins a much more rueful Gamera tradition: The child that knows everything. I can understand a bit of wish fulfillment in a series that is more geared towards kids, but that doesn’t make it any less irritating. By upping the monster quotient and increasing the pace, Gamera vs. Gyaos is very entertaining. The fact there are casualties among the people and injuries to the monsters, keeps the story feeling like there is something at stake here. Sure, it is easy to assume Gamera is going to save the day, but the movie is not afraid to make him work for it. At the same time, there are some lighter, child friendly elements that both work at odds with the violent fighting and give the whole film a quirky life all of its own. 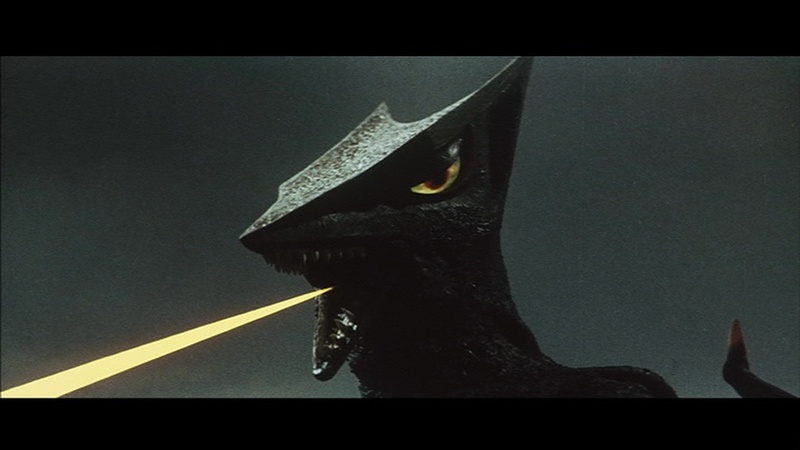 Gyaos is a great monster and it’s easy to see why he became Gamera’s most popular opponent. There is something really sinister about him and the fact that he eats people and can cut helicopters in half makes him all the cooler.